On Oct. 4, a select group of SU students who are either members of a multicultural student dance organization, or just dance lovers at heart, began a six-week artist-in-residence program learning traditional West African dance from master teacher Biboti Ouikahilo. 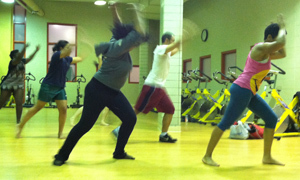 Through Nov. 8, participants can be found dancing to the beat of live Africans drums on Tuesday evenings, between 9-11 p.m., in Archbold Gymnasium’s first-floor exercise room. The residency will culminate with the students performing a piece they learned in the master classes during International Education Week’s Music Festival, “Music Beyond Borders.” The festival will be held on Nov. 16 from 6-8 p.m. at Hendricks Chapel, followed by a reception in the Noble Room. “This unique opportunity for students to study with master teacher Biboti Ouikahilo drives domestic students into the international arena, where the vision of global becomes inclusive of everyone,” says Elane Granger, associate director of student services at the Slutzker Center for International Services. Ouikahilo is an internationally acclaimed, professional African dancer, drummer and choreographer who has more than 30 years of global performing and teaching experience. He was born in the Sinfra Progouri West region of the Ivory Coast, West Africa, and spent 17 years with the National Dance Company of the Ivory Coast. In 1997, Biboti came to the United States to co-create Africa Azolou, a celebratory show of Africa, Brazil and the United States, and then settled in New York City for six years after the show toured. In 2003, Biboti moved to Syracuse, where he currently shares his artistic talents with the Central New York community through workshops, master classes, community classes, performances and lecture/demonstrations. The West African Dance residency is co-sponsored by the Pulse Performing Arts Series, the Slutzker Center for International Services (SCIS) and the Office of Student Activities. It is one dimension of a larger multi-disciplinary, cross-cultural collaboration between the SU campus and Syracuse community that builds on the tradition of SCIS’s annual International Music Festival. Historically, during International Education Week, which occurs this year from Nov. 12- 16, SCIS hosts a festival that celebrates multicultural diversity in the art forms of music, dance and poetry. New to this year’s festival, “Music Beyond Borders,” is the inclusion of artists-in-residence from the local, professional arts community, along with an academic component to illustrate the intercultural connectedness of music that derives historically from shared traditions and experiences, led by Carol Babiracki, associate professor of ethnomusicology in the Department of Art and Music Histories. For more information on International Education Week and this year’s festival, “Music Beyond Borders,” contact Granger at elcarras@syr.edu.